Video streaming and other forms of online learning resources—including audio, images, podcasts, lecture capture files—have become an integral component of instructors’ and students’ eLearning experience. ShareStream’s Video Tool for the Sakai® LMS enables educational institutions to extend Sakai with an easy-to-use, YouTube-like solution for instructional media. access online learning resources through streaming media to desktop computers and mobile devices or (if permitted) through podcasts and RSS feeds. ShareStream’s Pick-n-Play application provides faculty and students with an intuitive and user-friendly video solution for teaching and learning, available seamlessly within the Sakai Learning Management System. 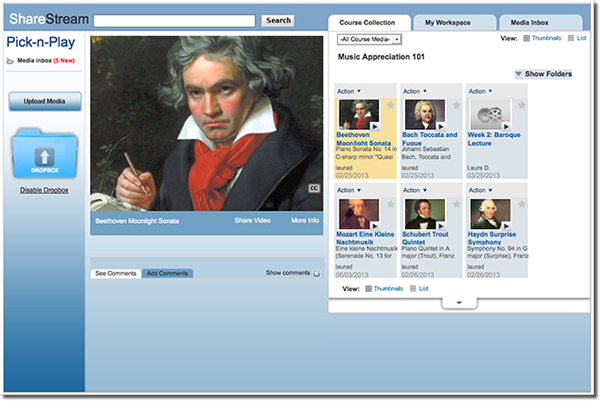 The Pick-n-Play application includes ShareStream’s Media Dropbox for student-generated content. MediaManager provides instructional technologists, media-services staff and system administrators with a turnkey solution for campus-wide video content management, complete with digital rights management (DRM); streamlined media ingestion; collection management; metadata and cataloging; media publishing features; reporting and analytics; and more. and from other features in the Sakai CLE. Instructors are able to utilize ShareStream’s media capabilities to create video assignments in Sakai, and students are able easily upload and submit video assignments to instructors for assessment. ShareStream student-media submissions made through the Sakai assignment tool populate directly within the Sakai Gradebook. Sakai is a trademark of the Apereo Foundation, registered in the U.S. and other countries. The composer images are in the public domain in the United States, and those countries with a copyright term of life of the author plus 100 years or less.